Visit the Goto Islands at Uminoie - Kampai! : Kampai! Uminoie (Umi No Ie – “oo-me-no-ee-ay”) is one of my favorite izakayas in the city for the simple fact that it’s hard to find, easy to miss, small, relaxed, and feels like home. Like most izakayas, it’s situated on a street rather than an avenue. I’m guessing this is because it keeps the rents down since customers tend to linger for a long time. What makes Uminoie special is that there is almost no signage. I had to go here 4 or 5 times before I knew where on the block it was. I’ve walked past it more than once while looking for it. For the longest time I thought it was on 5th Street (it’s on 3rd). Just the other day a friend swore it was on 4th. Adamantly. You step down into a narrow ground floor space. Two tatami tables behind fishing nets are the first thing you see. One is for a couple and the other will fit a few more guests. Another standard western table sits before you reach the small bar with perhaps 8 seats. A longer row of tables sits along the left hand side in the rear of the space. I would be surprised if 40 guests could dine at the same time. This would also be a trick for the chef since she does all of the cooking for the entire restaurant in a 6×4 space behind the bar. It’s pretty incredible to watch. Mesmerizing even. The menu is pretty simple, relatively short, and mostly authentic Japanese comfort food. It’s a single 8 1/2 x 11 sheet of paper printed on both sides with a smattering of small plates and a few larger rice dishes. There is almost always a specials list on a single index card and buta kakuni (braised pork belly) is almost always on it. If you see that option, get it. This is one of my favorite kakuni in the city. Really savory, sweet, and melts in your mouth. They’ve also got Eihire, the dried skate fin, which they grill lightly with a side of Japanese mayo. Goyanchampu, a bitter melon stirfry, is worth ordering as well if only because you’ll rarely see it anywhere else. It’s an acquired taste, but worth trying. Standards like edamame, gyoza, kara age (Japanese fried chicken), and agedashi tofu are available for the less adventurous and all of them are nice examples of the dishes. Can’t remember having had anything here that I wouldn’t order again. Nothing is super fancy, but it’s very nice homestyle cooking. Comfortable and relaxed with fresh ingredients. What makes the menu truly unique is the choice of ingredients. The menu is largely inspired by the cooking of the Goto Islands, a cluster off the coast of Nagasaki. The local recipes make a dashi (broth) using agodashi (dried flying fish) rather than the more usual dried bonito (skipjack tuna) or dried kombu (seaweed) broths. This gives many of the recipes a unique flavor compared to other Japanese restaurants even if the dish carries the same name. The Goto Udon, with noodles sent from Nagasaki by the owner’s father, is a must-have, especially on cold nights. This is where Uminoie shines. Like so many izakaya, drinks are a big part of the menu, but Uminoie takes this to the next level. 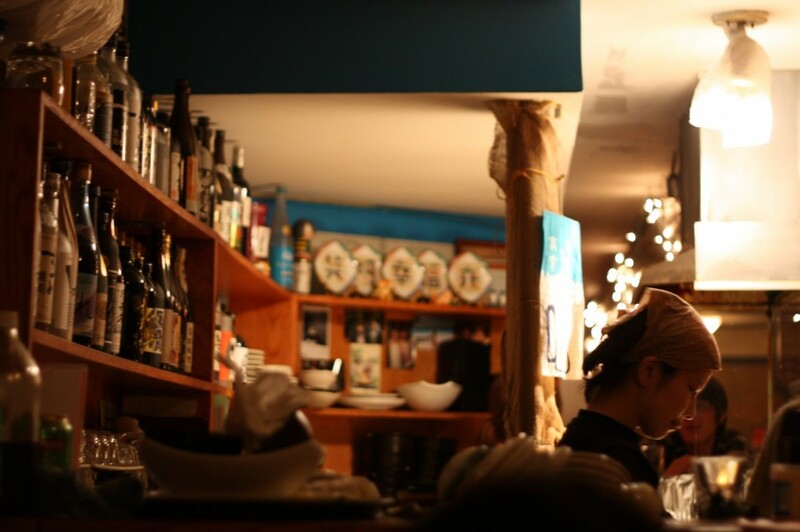 With the longest shochu selection in the city (nearly 40), you can’t run out of things to try. 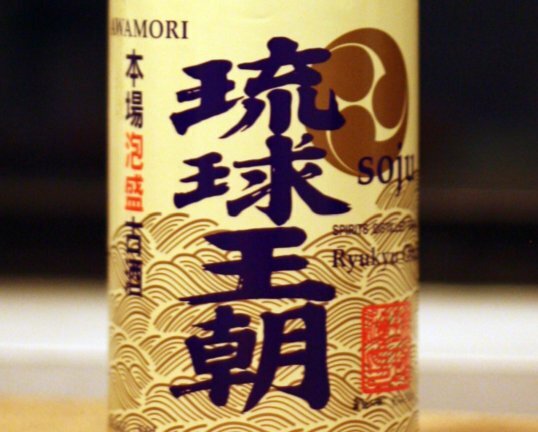 Sake and beer are also available, but shochu is the star. Particular gems are two uncommon imo shochus from the Kyoya Distillery, Kappa No Sasoi-mizu and its older brother Heihachiro. Uminoie even offers they’re own concoction, a shiso shochu. If you know shiso and you know shochu, how could this possibly go wrong? It’s not entirely clear to me why this izakaya isn’t a whole lot more popular than it seems. According to the owners they got very busy after being written up in the New York Times, but things have settled down again. I’ve never had to wait for a table no matter what day of the week or what time of the night. I like this, because it means that no matter how busy other places are in the trendy East Village, this gem will always have a place for to sit down and relax with friends. I’m sure they’d like to be much busier, but I’m not sure how their petite kitchen (and chef) would handle it. 2017 Update: this place is still wonderful! I found it years ago and although I couldn’t say I’m a regular (I live in Astoria and work in midtown) I truly appreciate Uminoie as one of the sweetest and most genuine “home-cooking” Japanese restaurants in the city! I’m also a huge shochu fan who found this place after tiny Shochu Bar Hatchan closed (midtown East). I recommend sitting at the bar because all the food is prepared right there and it’s fun to watch even the simplest of dishes made with finesse, but larger parties have other seating options as well, both Western and Japanese. Best of all is the vibe, which is so very relaxed and warm, even on a Friday night in the East Village, which is basically a magic trick at this point! Leave the hordes of NYU students and their cell phone dramas on St. Marks, and walk a few blocks down and over to Uminoie for a calmer, adult, visit with great food and drink options. Favorite moment: the night I was there and a table of Japanese friends began singing along to Showa-era Enka songs! My heart broke! Aisome, which I discovered by chance at 1 or 8 in Williamsburg, Brooklyn, over the weekend, was a pleasant surprise. 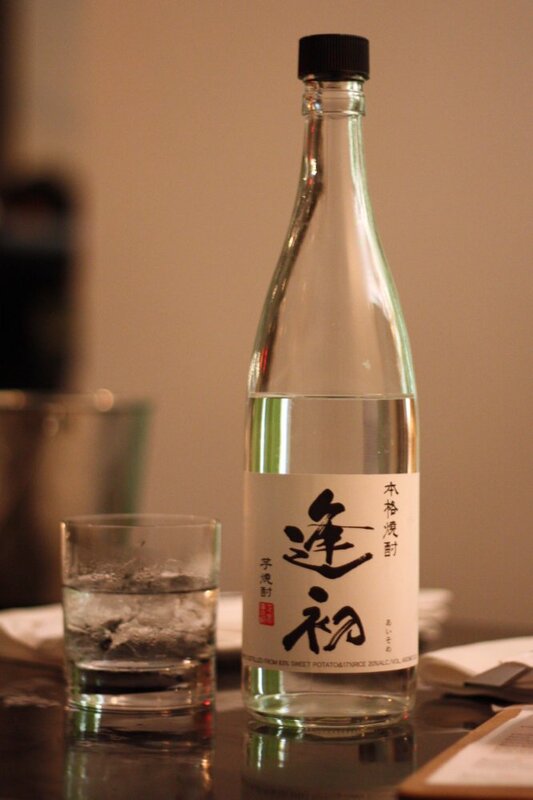 This is an imo shochu, but unlike other imo I’ve had. The nose is typical – the faintest hint of earth along with sweet potato – with a promise of sweetness. The initial taste doesn’t disappoint in that regard. It’s a slightly sweet start, but that disipates quickly.